If you are thinking of committing for life — or even just living together — it may be very helpful to contemplate some of the issues that can frequently drive a wedge in long-term relationships. 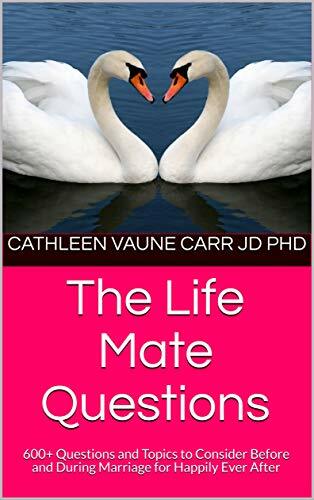 If you are seriously dating or engaged and you don’t have the time, money or access to professional premarital counselling, you will find this book to be practical, non-religious, easy to read, and very relatable. It might just save your marriage before it even gets started! Whether you are straight or gay, first timers or sixth+ time around, everyone should answer these questions honestly prior to tying the knot. The 600+ questions and 40 Character Traits of a Good Mate bonus section will help you both be better prepared for your marriage. This list is vast enough for even seasoned marriage counsellors to add to their own stash of questions. The questions are unelaborated and unexplained. You bring your own authenticity, uniqueness, and perspective to the interpretation of each. There are no answers or prompts, no suggestions. This format allows for everyone to answer from their own heart, mind and soul for the purest most reliable truth as they see it.